French Dip Sandwiches are one of Mike's favorite meals. Something about dipping the almost rare beef into a steaming hot bowl of cheese covered soup that says comfort food. As I mentioned before, French Onion Soup is a very simple and quick soup to make - great for a weeknight dinner or elegant dinner party. Slice baguette down the side to create an opening. Fold open. On one side - the bottom side - and top with beef and cheese. Place on a baking sheet. Place under the broiler for 2-3 minutes until the cheese is melted and bubbly. Slather on mayo and dijon on the top half and fold together. Slice into four portions. 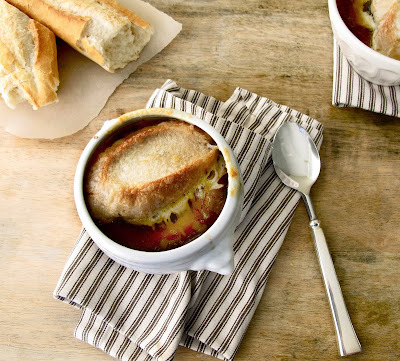 I love to serve these with French Onion Soup. Here is the very quick and easy recipe! Your pictures are absolutely beautiful! I am learning the ins and outs of food photos with a camera that does more than just auto. There is much to learn. :-) Your pictures make me want to be there at your table. Great job!